As you may know, my children love Indian food. Any time I am planning on cooking Indian or something that has a nice gravy, my recipe comes in very handy. 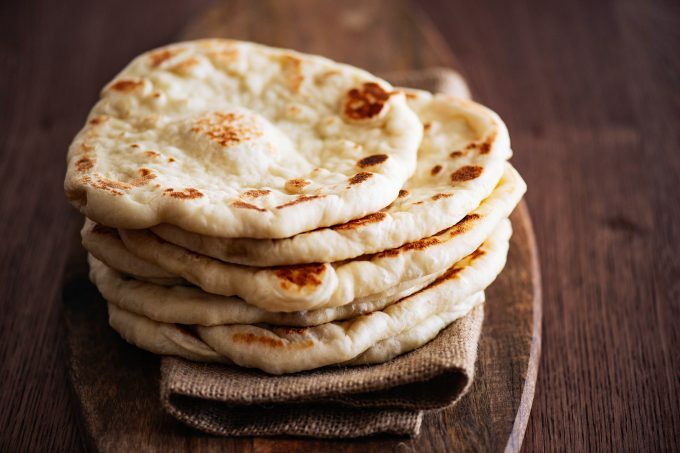 Many years ago I have posted a recipe for an oven based naan recipe. You can check it out, too. Where to use this naan? 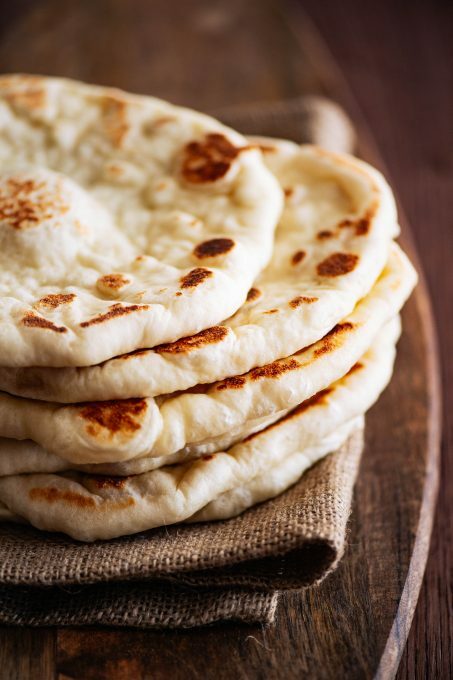 This stove-top naan recipe makes it happen when I need to whip something up very quickly. I also use this recipe if I need to make a quick flatbread. 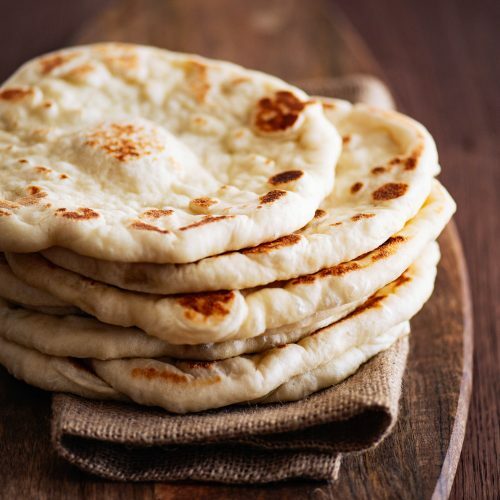 You can use this naan as a base for flatbread pizza and many more. Not to mention all the sandwiches you can make with it. I also like to use it for Manakish, Jordanian flatbread pizza. Another way you can utilize this naan is to toast it, cut in small pieces, and have them accompany different dips. The opportunities are countless. *Note: I want you to be careful with the flour. Don’t pack the measuring cup tightly. Measure it a little loosely and precisely. Start off with adding 3 cups and see if you need a little more. Flour consistency is a little different across the board, depending on the brand of flour you might be using. 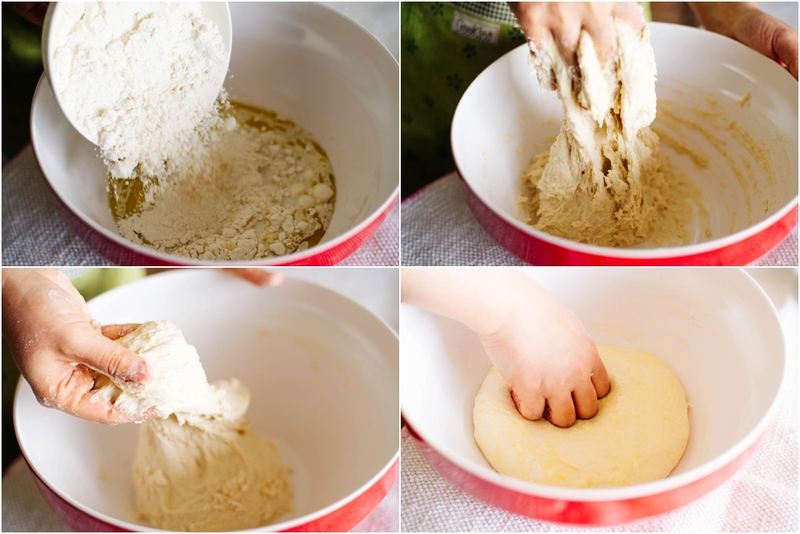 Please look at the photos and see how soft of a dough you will need to make. Our first step will be to wake up the yeast. Have a large bowl ready and add hot water and cold milk into it. This will create a warm mixture. Don’t wait too long before you add the sugar and yeast into the liquid. Warm liquid will wake up the yeast. Sugar will fortify it. Mix the ingredients with a small whisk and set aside for a couple of minutes. Once you see yeast foaming upon the surface of the mixture add salt, oil and mix everything. Measure out the flour and incorporate into the liquid. This process can be done in your stand mixer. The dough will be sticky and soft. As you keep on working the dough the stickiness will become more manageable. Kneading the dough is important to activate the gluten in the flour. Add a Tbsp of flour and knead one final time. 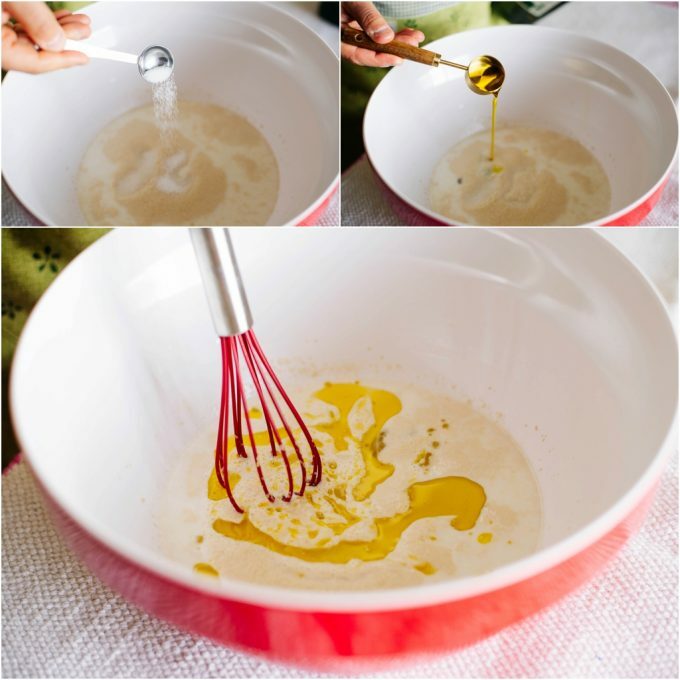 Pour a tsp of oil over the dough, make a ball out of it and place it on the bottom of the bowl. Cover the bowl with a towel and place a lid over the towel. Let the dough sit for about 15-20 minutes. In a warmer place, even 15 minutes is going to be enough. Once the dough doubles or triples in size, it is ready for the next step. Slightly oil your work station. Dump the dough on the surface and make a log out of it. Cut the log into 10-11 pieces, depending on the size of the bottom of the skillet you are going to use to cook the naans. Heat the skillet on medium. 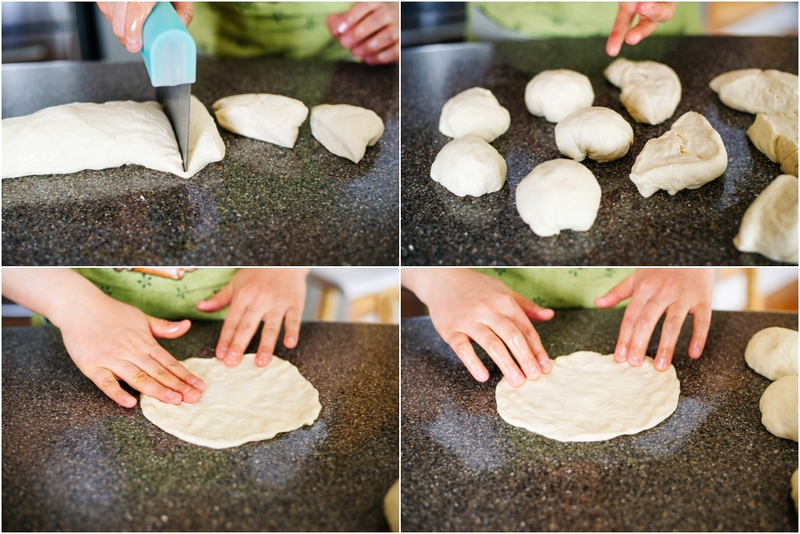 Start shaping and stretching the dough with your fingers. The dough is soft and very pliable, it will stretch very easily. 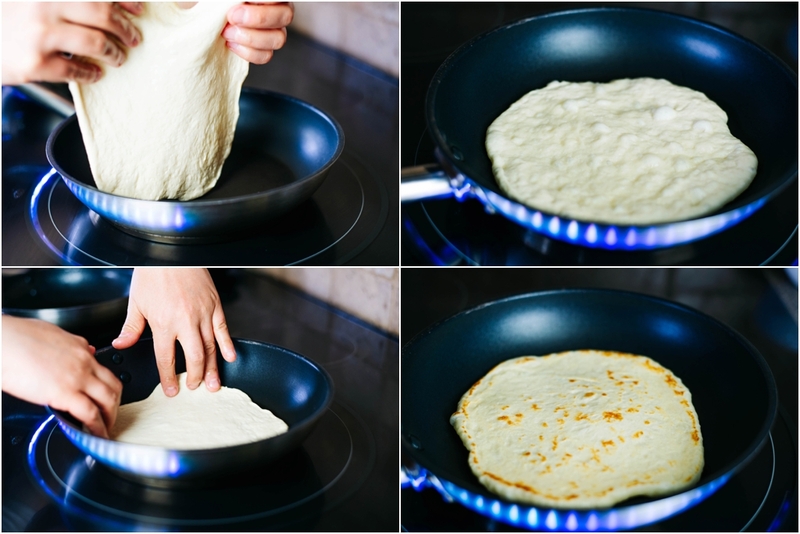 Make a thin pancake from the dough measuring about 6-8 inches. I use two skillets and 10 pieces of dough get cooked through in about 12 minutes. place stretched out dough on the skillet and cook about a minute and a half on each side. Watch for the color on the naan. If it is golden brown, it is ready to be flipped on the other side. If you like a little more color on your naans, keep them on the skillet a little longer. Once the naans are ready, I like to rub a little butter on them. This step is totally optional. Our first step will be to wake up the yeast. Have a large bowl ready and add hot water and cold milk into it. This will create a warm mixture. Don’t wait too long before you add the sugar and yeast into the liquid. 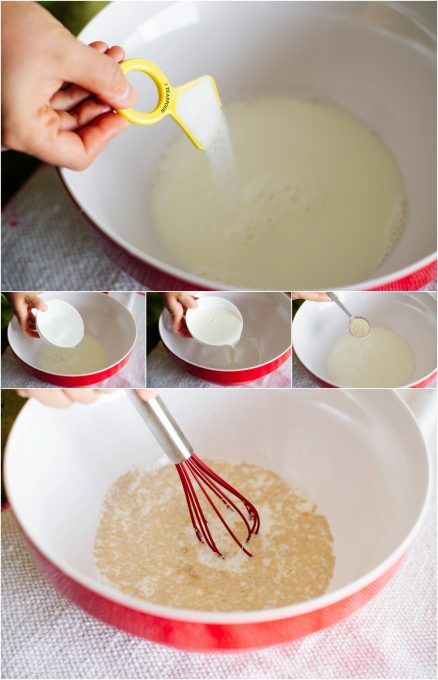 Mix the ingredients with a small whisk and set aside for a couple of minutes.